The Pittsburgh Penguins and Philadelphia Flyers series will go down as one of the wildest series of all-time in NHL playoff hockey history. There were many incidents throughout this series that no hockey expert will ever be able to explain. The Pens were supposed to be more experienced, have more leadership, talent, and a special teams advantage going into this series as a Stanley Cup favorite. The Penguins sincerely disappointed the city of Pittsburgh and their fans by losing to their cross-state rivals. The obvious thing would be to bash the goaltending and defense, but the Flyers’ goaltending and defensive play was not much better. Instead, we are going to dissect the five additional reasons as to why the Penguins faltered against the Flyers. Experts talk about having playoff experience and how important of a role experience can play in the NHL post-season. The core group in the Pens’ locker room is full of playoff experience, but playoff experience is useless if there is no leadership within the room. I cannot name a vocal leader in their locker room. I can’t even begin to pinpoint the leader. Some say Jordan Staal and others say Brooks Orpik. Sidney Crosby is the captain but he certainly is not the vocal leader. Everyone thought the Penguins would be fine without a grizzled veteran in their locker room once Bill Guerin retired. After this series, and the path in which it took, the Pens severely miss a vocal leader like Guerin. The closest thing the Penguins may have to a vocal leader is Orpik. He expressed his emotions after falling 5-1 to the Flyers Sunday afternoon at the Wells Fargo Center. “They played really really well. We didn’t play very well for three games. 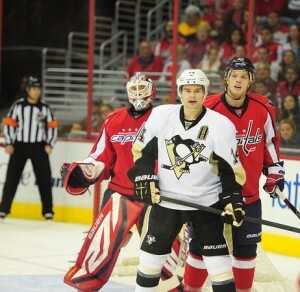 There’s obviously a lot of regrets in the room and stuff that you can’t take back,” said Orpik. As Orpik may blame the first three games, the Pens laid an egg in Game 6 to go right along with the first three games. There was no urgency in a series clinching game when the Pens were trailing. You think a leader would step up, rally the team or make an impact in the game, but this was nowhere to be found. I know that Crosby has not played consistent hockey for two years. However, he is the captain and so-called best hockey player in the world. If he does not want to be a vocal leader then he needs to lead by example. Crosby may have racked up a few points in this series, but he was completely invisible in Games 5 & 6. Maybe Sid did not have the energy and was not in as good of game shape as he has been in past years, but he needed to step up and lead vocally if not by example. Claude Giroux was caught breaking his stick off the crossbar after Game 5 at the Consol Energy Center letting everyone know that he had seen enough. I do not know if Giroux said anything to his teammates before Game 6, but he did say something to Flyer’s head coach Peter Laviolette. In an interview post-game, Laviolette relayed what Giroux said to the Flyers coach leading up to Game 6. Right after the opening faceoff, Giroux lined up Crosby right in front of the Penguins’ bench and put the Pen’s captain on his backside. Moments later, Giroux buried a wrist shot off the post 32 seconds into the game to beat Marc-Andre Fleury blocker side. Giroux told everyone right there and then that this series was ending today. That is a true leader right there. That is Mark Messier-like. Evgeni Malkin had not lit the lamp in the first three games of this series and in 12 straight playoff games before Game 4. He’s was neutralized by 19-year-old rookie, Sean Couturier. Malkin was one of the few Penguins to give a valiant effort in Game 6 by tallying the Pens’ only goal. Geno finished the series with 8 points but was missing in action in the first three games. Sidney Crosby also had 8 points, but isn’t he supposed to be the best player in the world? In previous years the Pen’s captain would completely control games. He would not be denied. The puck was consistently on his stick and he was creating scoring chances for himself and his teammates. However, Crosby was non-existent in Games 5 & 6, the two most important games of the season. People can try all they want to say Crosby is the best player in the world, but right now, no one is better than Giroux. He showed he is the most clutch performer in the league right now. The Flyer’s star center leads all players in the playoffs with 6 goals, 8 assists and 14 points. He was also a +6 which leads all skaters in the post-season. He made an impact in every game in this series. Giroux was dominate on the power play and had his hand in on all of the shorthanded goals the Flyers scored in this series. There was no question he outplayed Crosby and Malkin. Giroux’s 14 points were almost as many as Crosby and Malkin combined. The Pens were supposed to have the special teams advantage coming into this series being the only NHL club to finish the regular season in the top-10 of power play and penalty killing percentage. The Penguins finished 3rd ranked penalty killing unit in the league at 87.8% and the 5th ranked power play at 19.7%. The Pens great special teams in the regular season did not hold strong once the post-season began. The Flyers were 12 for 23 on the power play. These numbers are actually down from what they were at the beginning of the series. The Flyer’s PP was 11-17 at one point in the series for 64.7%. They ended the 6-game special teams clinic at 52.2%. The Penguins only surrendered 33 power play goals against in 82 games in the regular season. They surrendered 12 goals in 6 playoff games. The Penguins power play, on the other hand, did score at a 31% clip in this series. The Pens had 9 power play goals, but three of their PP goals were cancelled out when the Flyers scored 3 shorthanded goals in the series. For once the Pens scoring on the power play was not a problem. The issue was keeping Giroux and Max Talbot from scoring shorthanded tallies. Shorthanded goals can turn around an entire playoff series. That is exactly what took place against the Penguins. In games 2 & 3, Talbot broke the ice for the Flyers and scored a shorthanded goal in both cases. The 1st goal is usually the toughest goal for a team to register each game. Once the Flyers seized momentum in each game from these two monumental shorthanded goals, the flood gates were open. We have heard for years that the Penguins want to play 5-on-5 and are the best even strength team in the league. They killed themselves in this series by playing in too many special teams situations and having no discipline whatsoever. Since the Pen’s penalty killing unit could not successfully kill off a penalty, they needed to stay out of the box. Instead, they continued to take undisciplined penalties over and over again. Even after the street fight in Game 3, the Pens still did not learn their lesson and thought they could get away with a cheap shot here or a cheap shot there. What was it going to take for the Pens to learn they could not chance anything? If a play was the least bit questionable the refs were calling a penalty. Despite what head coach Dan Bylsma had to say about penalties, the Penguins continued to test the waters. Chris Kunitz can speak exactly to what his coach is talking about and how good the Flyer’s power play was when they scored PP goals on 3 straight penalties taken by Kunitz in this series. If you wonder why the Penguins couldn’t keep from taking ill-advised penalties, the answer may be in what Bylsma stated after Game 3 when asked about whether he thought Kunitz’s penalties were fair or undisciplined. Kunitz’s penalties were absolutely undisciplined and the refs always call the last cheap shot given out in a bunch. Bylsma needed to be straight-forward and say they were terrible penalties and call his team out for undisciplined play. The Penguins took 32 minor penalties and although not the case, every penalty seemed to result in a power play goal for Philadelphia. The discipline of the Pittsburgh Penguins was completely inexcusable. It was not too hard to see that Peter Laviolette out-coached Dan Bylsma in this series. Every move Laviolette made was the right move and every move Bylsma made was the wrong move. Laviolette is known for calling timeouts when the Flyers are trailing in games. While one would think this tactic would have lost its luster after some time, the Flyers continue to respond every time their coach calls a timeout. Laviolette’s timeout in Game 1 may have been one of the key reasons why the Flyers won the series. Laviolette also matched-up lines in the series. He put Sean Couturier out against Evgeni Malkin for as many shifts as possible. While Malkin should be able to out-play a 19-year-old rookie, Bylsma should have given Malkin every advantage to score in the series. He did not. Bylsma continued to throw Malkin on the ice against Couturier. Bylsma continued to do the same thing the entire series. Bylsma kept playing the same style the Pens had played all year. The Flyers were 4-2 against the Pens in the regular season and won the first three games of this series. Something needed to be fixed. Instead of changing the north and south style of play and stating the problem to be that the Penguins were not playing “their” game, Bylsma was stubborn and never changed a thing. There was no neutral zone trap or 1-2-2 in the offense zone to slow down the Flyers breakout. The Flyers had tons of time and space in every zone for the entire series. The Pittsburgh Penguins played one way the entire series. The Philadelphia Flyers were the superior team in this series without question. That is why the Penguins promising season is now over.